This past November during Odyssey’s olive picking week, Elizabeth Bitros from Long Island came to help with the olive harvest. 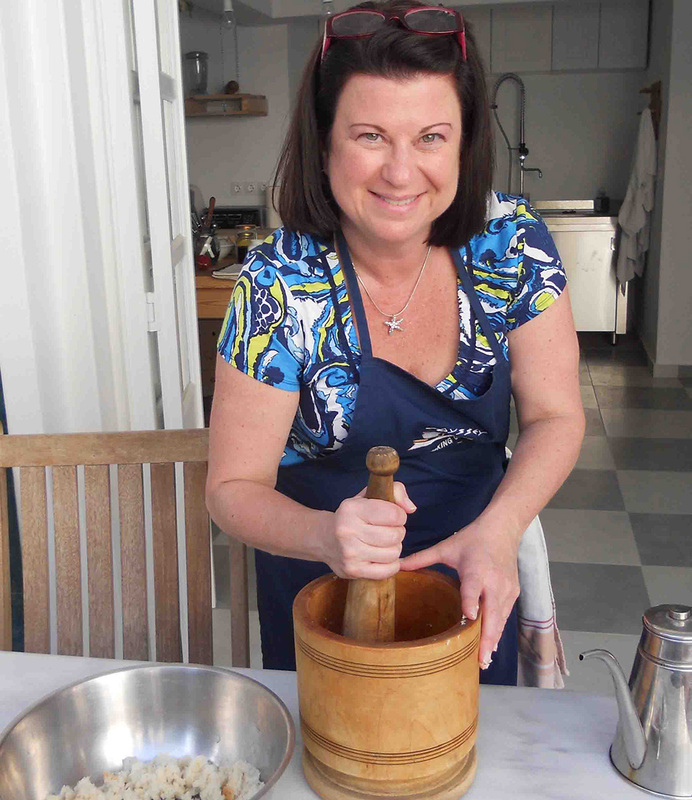 Liz visited Poros for the first time at Easter in 2013, when she did the week long cooking class. It was easy to love Liz from the beginning. 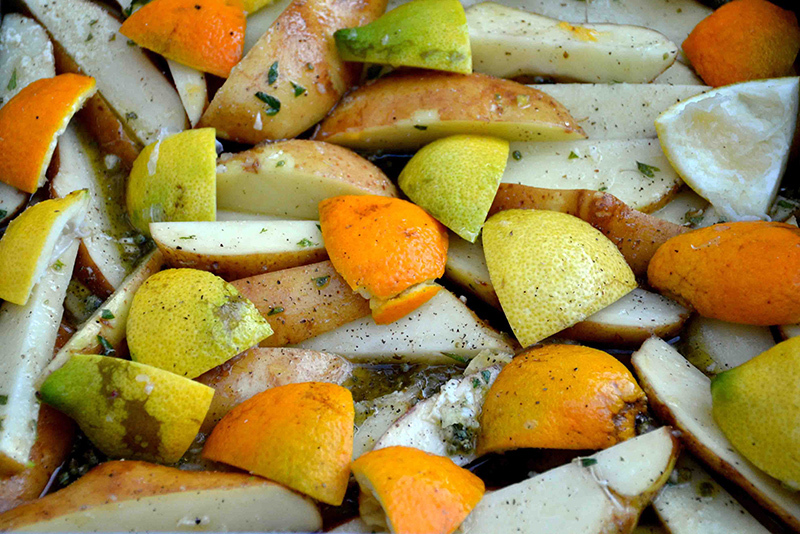 This is one of her favorite Greek recipes: Lemon and orange potatoes. We made this delicious recipe during the cooking class and again for Easter. Liz served them to her family last Christmas. To her the lemon and orange potatoes are a Greek staple to accompany a meal. She loves the taste of lemon and citrus. As you will notice reading my blog, just a few of my recipes are without lemons! 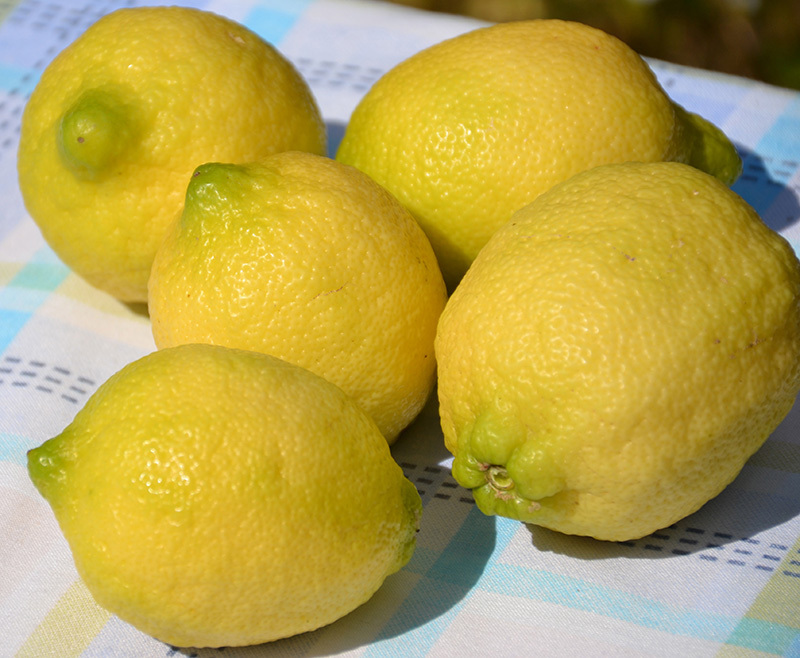 The lemon is the basic ingredient for most of our food, and there is hardly any kitchen in Greece in which you will not find this beautiful fruit. All the old houses in Poros have a lemon tree in their garden. It is not only a beautiful tree – with its pleasant fragrance in springtime – but also a very practical one providing each family with fresh fruit all year long. So you understand that when I make potatoes, I love to drizzle the juice of freshly picked lemons over them! In this recipe I am not only using lemons, but oranges as well. 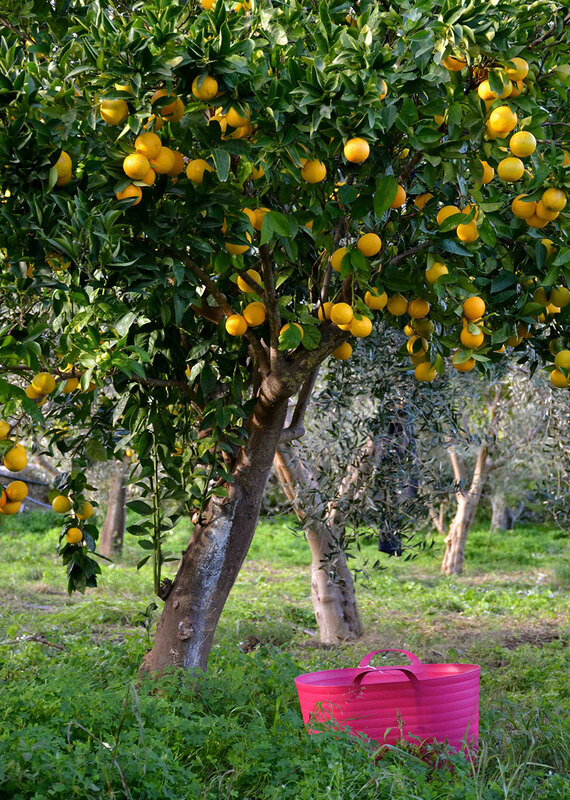 In this way the sour taste of lemons is combined with the fresh and sweet taste of the oranges. This natural mixture of flavors changes the earthly taste of the potatoes into a bright, sweet flavor. We start this recipe by cutting the potatoes into large pieces – like wedges – and place them on a metal roasting pan. 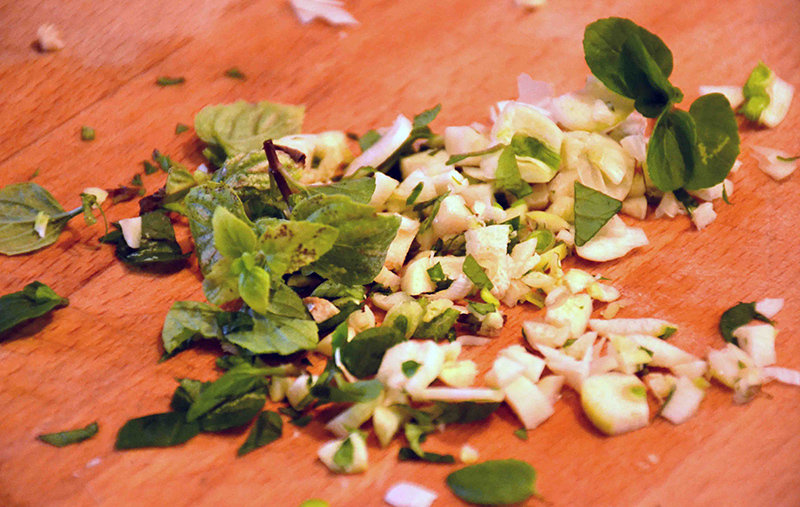 Cut the fresh oregano and the garlic. I sometimes add fresh basil, just to give a twist to this classic Greek recipe. 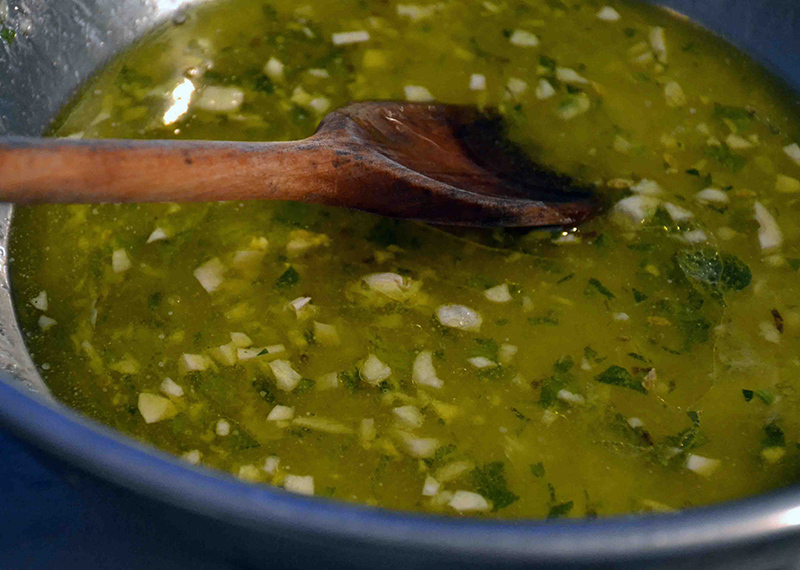 Mix the herbs and the garlic together with the oil, wine, juice of the lemons and the orange, the mustard and salt and pepper. Simply pour the mixture generously over the potatoes. Important is that we use the whole fruit, not just the juice of the fruit. So we add the squeezed lemons and oranges and put it all into the oven. By doing this you really enrich the flavor of the roasted potatoes. When the lemon and orange potatoes come out of the oven, the smell in your kitchen will turn the winter into summer! 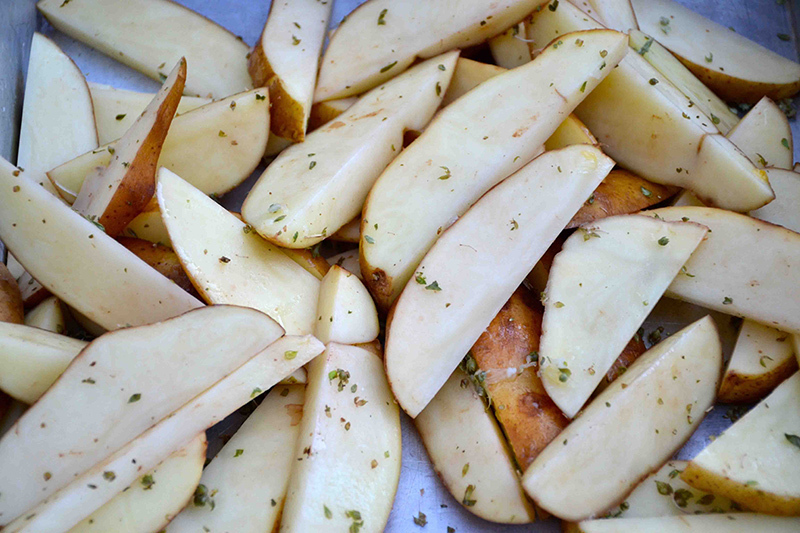 Cut the potatoes into large pieces like wedges (we call them kidonates) and place them on a large metal roasting pan. Put the oil, wine, oregano, the juice of the lemons and the orange, the mustard, garlic and salt and pepper into a bowl and mix well. Simply pour the mixture generously over the potatoes. Then add the squeezed lemons and oranges. By doing this you really enrich the flavor of the roasted potatoes. Bake for 40 minutes at 180 C or 400 F, or until they are cooked through. Depending on the type of the potato you are using the cooking time varies. We use potatoes from Tripoli in the Peloponnese. This recipe is enough for 4 people but it is a side dish. As a main we usually serve it with meat that is cooked with the potatoes in the oven. Just made these potatoes last night for guests. Turned out perfectly – thanks Katerina! Hi Connie !!! I am very happy youtried them !! they are soooo good !! My greetings to you all !! !